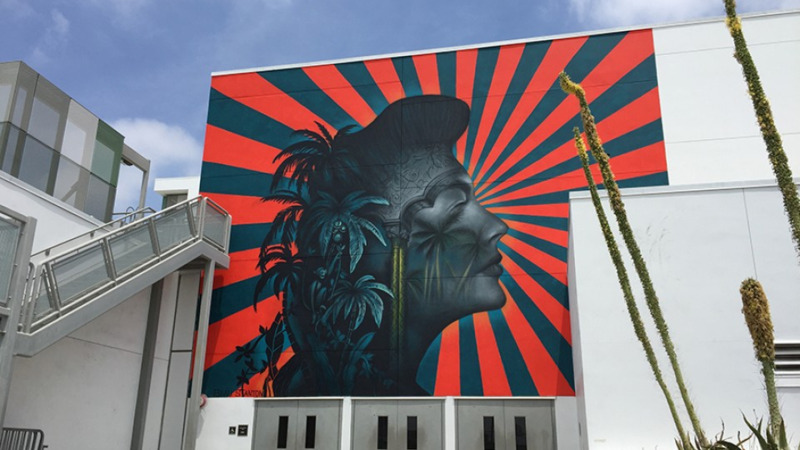 A mural depicting classical Hollywood actress Ava Gardner at a public school in Los Angeles' Koreatown neighborhood will be painted over later this month after local organizations said the work resembled the rising sun symbol on the Imperial Japanese Army's flag during World War II. The Wilshire Community Coalition, along with local Korean organizations and individuals, in November sent the Los Angeles Unified School District a letter detailing "serious concerns about the hate symbol portrayed" on a wall at Robert F. Kennedy Community Schools' campus in the heart of Los Angeles' Korean community. "This flag symbolizes the Japanese military aggression which resulted in one of the most of horrendous and gruesome crimes against humanity in human history," the joint letter reads, referencing the Japanese army's wartime atrocities in Nanjing, Manila and Singapore. Artist Beau Stanton's murals can be found around the world, many of them featuring the ray motif. His mural, completed in May 2016, is one of several on display at the school. Gardner's image pays homage to the property's history as the former site of the Ambassador Hotel -- where Robert F. Kennedy was assassinated in 1968 -- and the Cocoanut Grove nightclub, which the actress frequented. "Art is intended to celebrate the human spirit, but in this case, it has offended a group in our community," Roberto A. Martinez, local district superintendent for the Los Angeles Unified School District, said in a statement released Tuesday. "We will be removing the mural over the winter break, and we are looking forward to working...on next steps in the selection of a new mural." Stanton told the Los Angeles Times that he is "disappointed," noting that "radial lines terminating at a focal point" are a common design found throughout history. The National Coalition Against Censorship opposes the mural's removal, citing concern over the right to free expression. "The surrounding rays are a common device found in many of artist Beau Stanton's murals," the NCAC wrote in a statement. "Removing the mural in response to their complaints sets a dangerous precedent of submission to public pressure in assessing art and allowing students' access to diverse viewpoints and ideas," it said.